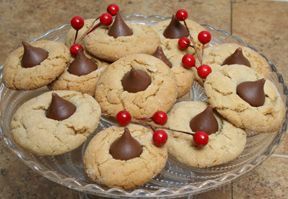 Sweet peanut butter cookies topped off with a chocolate kiss on top. Perfect anytime of the year, especially the holidays. 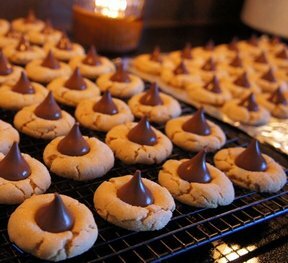 Remove foil from chocolate kisses. Beat butter, peanut butter and sugars in large bowl until fluffy. Shape dough into 1 inch balls. Roll in granulated sugar and place on ungreased cookie sheet. 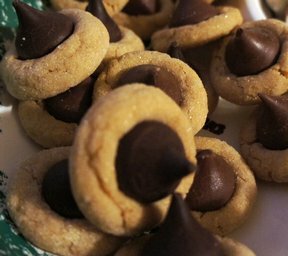 Immediately press a chocolate kiss into center of each cookie; cookie will crack around edges. Remove from cookie sheet to wire rack and allow to cool completely. 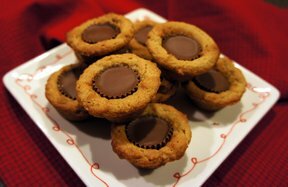 "I used chunky peanut butter and consensus says creamy is better. Flavor is great though. Be sure to press chocolate in otherwise they tend to fall out."